The majority of my dinner inspiration occurs while taking a stroll through the produce area of the market. On this visit I came to a halt in front of the baby artichoke arrangement. Instantly I knew I was going to try them in a sauce for pasta. Never having prepared baby artichokes before I knew with a little trimming you may eat the whole thistle. After a little research I found it is very necessary to soak your trimmed artichokes in lemon water, otherwise they turn an unsightly brown hue. I read a couple of appetizing sautéed baby artichoke recipes and came up with an idea. Shallots instead of onions. 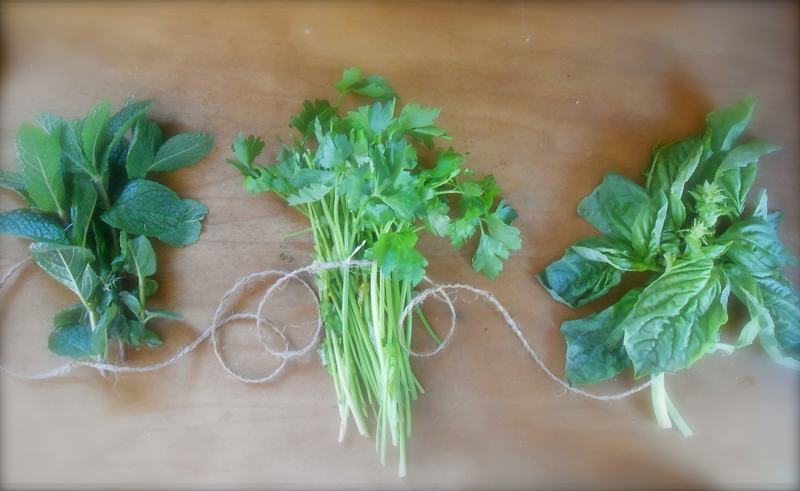 Herbs from the garden. And one of my favorite pasta sauce ingredients, pancetta. This is very simple and not too rich. The three herbs really give it a fresh spring-like flavor. For this dish I chose orecchiette because it is my son’s favorite. He calls them hard hats. Squeeze your lemon into a large bowl of water and drop the lemons in too. As you are slicing your artichokes add them to the bowl so they do not turn brown. Bring a large pot of water to boil for the pasta. In a large skill, over medium heat add your olive oil and pancetta and cook until brown. Add shallots and garlic and cook another 4 or 5 minutes. Drain the artichokes and add them to the skillet. Raise the heat to medium high and cook until the edges have turned a nice golden brown. Add wine and reduce. Cover pan, lower the heat to simmer and cook another 8-10 minutes. Season with salt and pepper to taste. While pasta is cooking chop the parsley and mint together. Slice the basil into little strips. After your pasta has cooked and before you drain, reserve 1/2 cup of your pasta liquid. 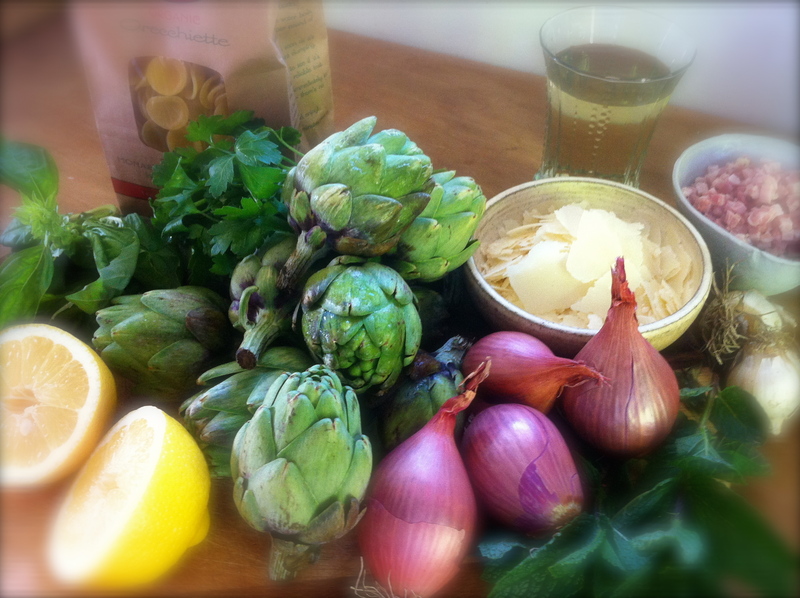 Stir the reserved pasta water into your artichoke sauce and bring to a soft boil. Add drained pasta and parsley to the sauce and toss to combine and coat well. Turn off heat. Serve right away topped with cheese and basil. I have to make this, I love baby artichokes this dish is so fresh and springlike. Love it! I really enjoyed it. First time cooking baby artichokes and I’m a big fan. Way easier than I imagined. Thank you! i love your use of so many wonderful vegetables! Too early for artichokes here in Ireland. Lovely dish. Yes, spring now. Though, it’s very late getting here. I have never cooked my own artichoke. Only out of jar. How bad is that? Shall be on my to-do-list. This looks great. I really like mint in pasta. Love artichokes, but hate preparing them :) Reading you looks so easy ;) The recipe looks super yum! I just bought some baby artichokes! Glad I stumbled upon this recipe! Wonderful recipe! I recently discovered that it isn’t that difficult to trip baby artichokes, and am no longer afraid of them. 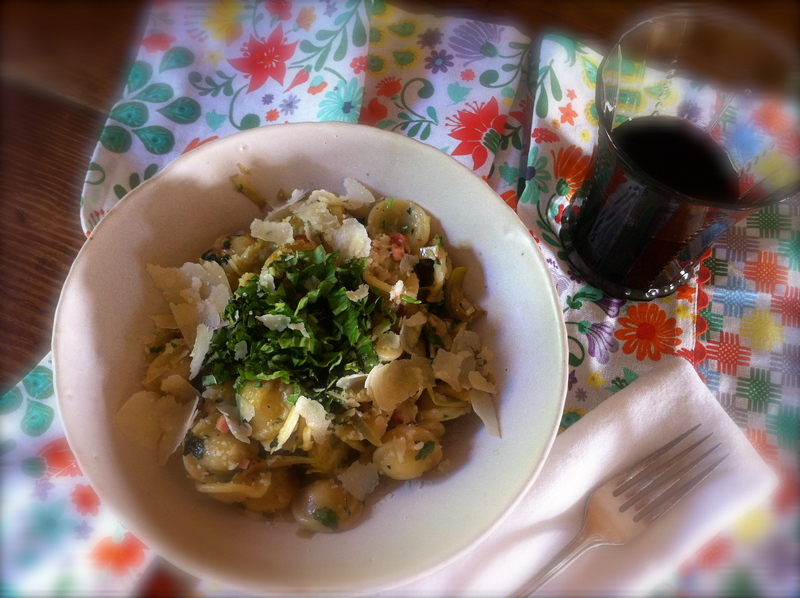 And a simple, seasonal pasta dish…. there is nothing better! So I just made this dish for lunch, and I loved it! I really enjoyed the very subtle minty touch, and just loved the taste of pancetta together with the artichokes. Lovely dish. Well, you just brightened up my morning! I am so happy you enjoyed it Darya. Thank you! Thank you! Over here artichokes are affordable, when they are in season… the large globe varietal is a meal in itself! Never cooked artichokes yet. If I decide to try I will use your recipe. I love artichokes in pizza so I’m sure I’ll love it in pasta, too! You will love it in pasta Dolly. In the past I have used the canned artichokes in pasta sauce. This time I decided to try to cook them. I was very satisfied with the outcome. Much better texture and flavor. Have a good weekend! Your pasta dish sounds wonderful. Hopefully baby artichokes will be in our market soon. Thank you Karen. They are a new discovery for me. I’ll love them now. I love artichokes both the wee and the large and they often find their way into the bowl with my pasta dishes. Have to try this one! We love them too! This is the first time I actually used fresh artichokes in my sauce. I always used the canned hearts before. I really appreciated the texture and flavor. The canned ones are slightly…vinegar-y. Damn, i really craving to try fresh jerussalem artichoke…. Love your blog! Your handsome husband told me about it…. You know, with hamburgers I have a (cheap and plastic) mandolin that cuts French fry shapes that I roast in the oven in almost an identical manner. So good and appeals to my stable of picky eaters as it is such a familiar shape. Love your writing and recipes…. Lots of ideas I want to try! Janos! Hi. I’m so glad you stopped by my “little blog”… I really want to purchase a mandolin. It seems every time I make roasted potatoes I shape them differently. Long ones, tall ones, short ones, fat ones….Thank goodness our youngin is not picky anymore! Thanks for your kind comment. This looks delicious! I never know what to do with artichokes so will have to try it! Hi! I know…artichokes are such a strange looking vegetable. We’ve all tasted them but shy away from cooking and experimenting with them. They are so tasty this way. I sure love your blog! I’m gonna get some when I do the shopping tomorrow. Are they difficult to prepare? Their skins look like a coat of armour!! ahahaha! True. They are quite easy to prepare. The large ones only require a 45-50 minute steaming. You’ll be pleasantly surprised how easy. I usually snip the thorny tips off with scissors before I stem them. Great tip, thanks! Will let you know how I get on! You are currently reading pasta with baby artichokes (orecchiette con carciofini) at COTTAGE GROVE HOUSE.